Four million people will turn 50 this year, and they’ll instantly become invisible, joining more than 100 million other Americans who’ve already disappeared—at least to most companies that seek to sell us stuff. Even though Americans over age 50 hold about 80 percent of U.S. household net worth, about 90 percent of all marketing targets people ages 18 to 49. Much of the remaining 10 percent actually directed toward us makes you think older Americans buy little more than prescription drugs, walk-in bathtubs, large-button cell phones, and emergency alert pendants. 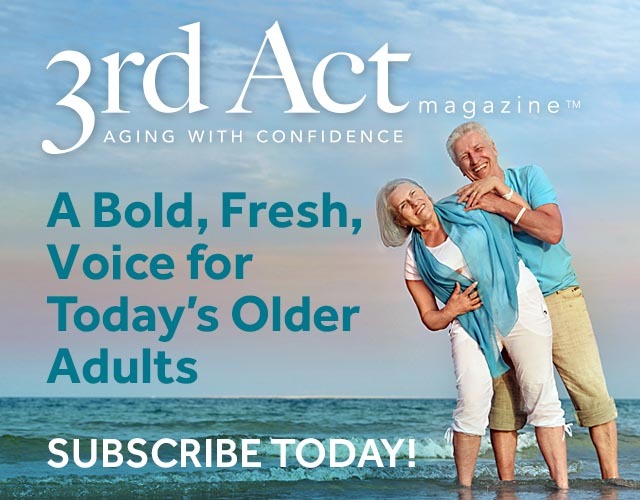 “Even worse than being ignored, of the stingy trickle of ad dollars allocated to targeting Boomers, much shows up in depictions that are clumsy, cringe-worthy and condescending,” writes Barry Robertson of the Boomer-Plus Consulting Group, which folds in the older members of Generation X (born in the late 1960s, and now turning 50) to create an even more powerful demographic bloc. One big reason for this oversight: Most ad agency employees are young, and they’re creating ads for people their age. It shouldn’t be a big news flash, but older Americans have a lot of money to spend, and people over 50 actually account for 60 percent of all retail sales. Just as interesting as what we buy is why we spend how we do. Here are a few characteristics that experts have noted about seniors’ immense spending power. Everyone likes a good deal, but older Americans especially like to get good value for every dollar we spend, so we prefer quality items that will last. Eyeglasses are a good example: Although many younger people who wear single-vision glasses are buying cheap eyewear online, Boomers with more complex prescriptions happily turn to hands-on professionals who can outfit us in person with state-of-the-art progressive lenses in a stylish frame that helps us see well and look good. We’re also eager to have our spending reflect our values, whether that’s supporting favorite charities or companies whose political leanings mesh with our own. A 2015 study by Age Wave found that Boomers will donate about $6.6 trillion in cash and $1.4 trillion in volunteer services between now and 2035. That’s a healthy chunk of the estimated $15 trillion that people over 50 will inherit over the next few decades. It’s not just millennials who are finally leaving their parents’ homes. Between downsizing, remarriages, and late-in-life divorces, people over 50 have a big appetite for buying everything we need to feather a new nest, from furniture to housewares. Meanwhile, people who plan to stay in their current homes are investing in upgrades to make those dwellings safe and comfortable. Although tech savvy is often identified with youthfulness, people over 50 are avid consumers of both old media (TV, radio, newspapers, and magazines) as well as new (social networks, streaming services, and apps). A study by Slice Intelligence actually found that men ages 65 and up spent close to a thousand bucks on Apple products in 2014, the most of any age group. After all, Bill Gates and Steve Jobs were both born in 1955, and Boomers were present at the creation of modern technology. The occasional cool new gadget notwithstanding, many older Americans have little need or appetite for more stuff, so many of us spend our cash making memories. When we reach the point in our lives where we’re downsizing our possessions so our loved ones don’t have to sort through them, choosing travel or charitable giving over knickknacks or closets full of clothes makes sense. For decades, some Boomers have led the way in questioning mindless consumerism, and many older people have reined in spending, either by choice or necessity. A study by JPMorgan Chase found that day-to-day spending among people 65 and older fell nearly 8 percent from 2014 to 2016. Millions of us are still living in the long shadow of the 2008 recession, which harmed many middle-income Boomers who’ve had to delay retirement plans. (In fact, a majority of Boomer households still have at least one person working.) Many people over 50 continue to help adult children who are stymied by student loan debt or other needs. But many of us are just spending less out of principle. Whidbey Island resident Vicki Robin, co-author of the landmark 1992 book Your Money or Your Life, is now in her 70s and continues to advocate for mindful attitudes toward money. “Enough is the quality of having everything you need and want but nothing in excess, nothing that burdens you,” she told The New York Times last November. That sounds like a financial goal to which we all can aspire. We can also insist that companies and marketing agencies not take us for granted. Millions of people are turning 50 every year, and older Americans are a growing, diverse demographic eager to learn about new brands and innovations—even as we’ve learned that money is only one way to measure happiness. Julie Fanselow is a Seattle-area writer who occasionally muses on money matters at surelyjoy.blogspot.com.